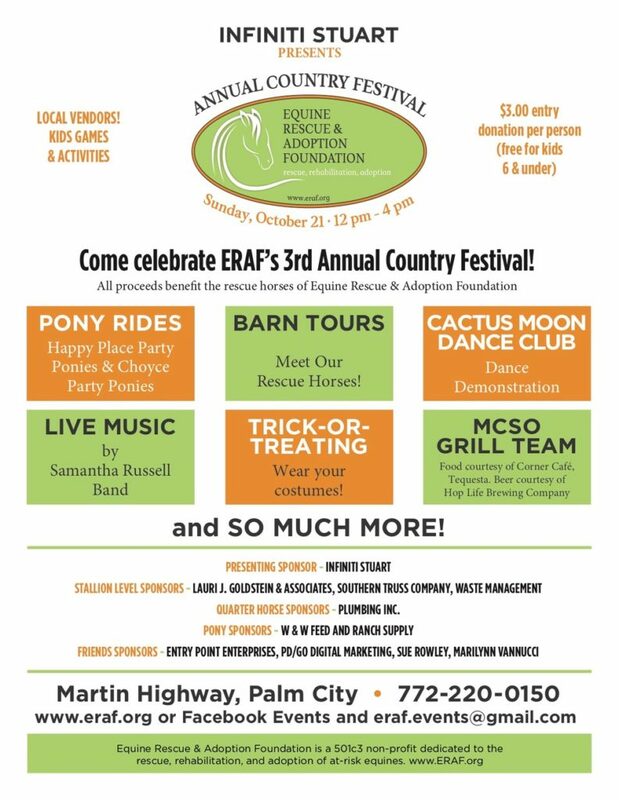 Plenty of fun for everyone including barn tours, pony rides, games, a scavenger hunt, horse demonstrations, Cactus Moon Dance Club demonstrations, live music by the Samantha Russell band, the Martin County Sheriff’s Office cooking up hamburgers and hot dogs and more. $3 donation and children 6 and under free. Festival will be at the ERAF Community Center. Festival location: 6400 SW Martin Highway, Palm City. Festival features live music, barn tours, kids’ activities, pony rides and more. Come be part of the fun! All proceeds benefit rescue horses.